The following appears in a description of the book A DUFFER’S HANDBOOK OF GOLF by Grantland Rice and Clare Briggs, on the Classics of Golf website. And despairs of himself as a dunce. Darling, not satisfied that he had a complete answer, asked other questions. Was he standing properly? What about his grip? Should he worry about the bunker ahead? Although written more than a hundred years ago, Lord Darling’s words of advice are hard to improve upon! No game has a richer array of terms than golf. 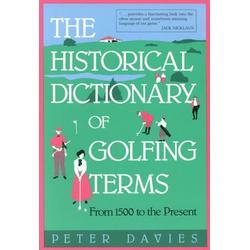 Five hundred years of golfing have built up an extraordinary vocabulary. …in a magazine alleges that the terminology of golf is peculiarly repulsive, and instances “top,” “foozle,” “tee,” “stymie,” “divot,” and “bunker,” as the cacophonous offspring of a degraded invention. Almost as much as when I lay it. Putter has still a poignant beauty. As of a man who beats the air. Means a half-iron shot laid dead. Off-side and deuce and maul and sett? More loathly words I’ve never met. And all her words are words of beauty. Where is Johnson’s Anodyne Liniment When Tiger Needs It? Let us suggest to them one more. 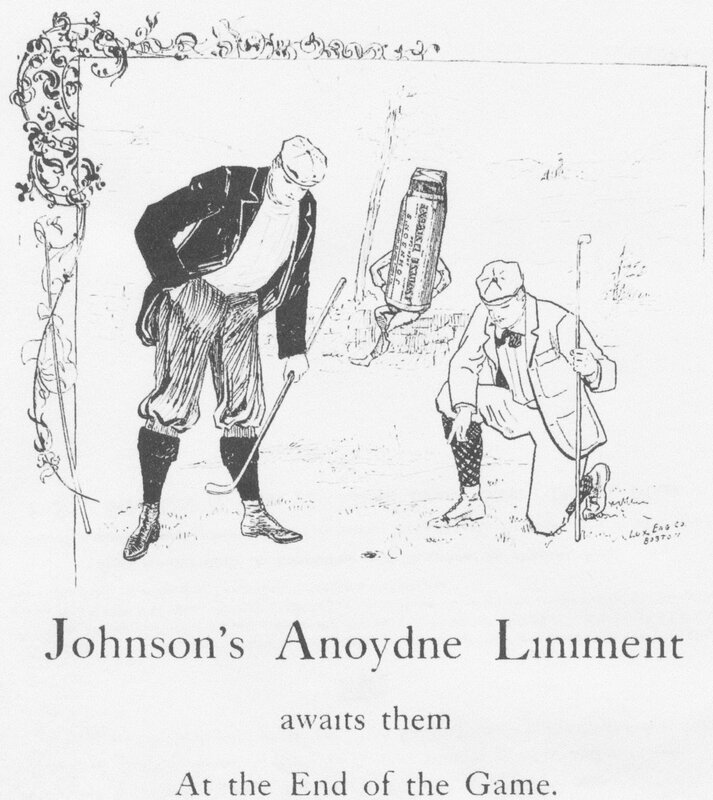 A Liniment called Johnson’s Anodyne. It soothes every ache, every bruise, every cramp, every irritation, every lameness, every swelling everywhere, and speedily relieves and cures every ailment caused by inflammation. It is for INTERNAL as much as EXTERNAL use. It was originated in 1810, by Dr. A. Johnson, an old family physician, for his own practice. It is used and endorsed by athletes everywhere. So Tiger, now that you have your MRI results, just get a few bottles of Johnson’s Anodyne, rub some on your neck, drink the rest and you should be hitting them long and straight in no time! 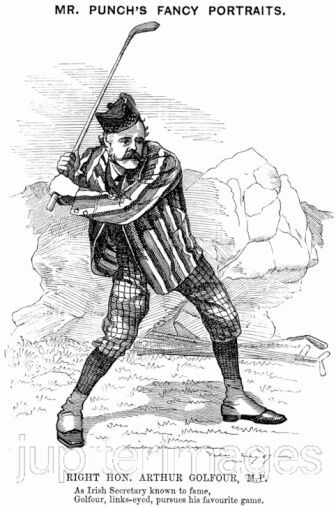 Arthur J. Balfour (1848 – 1930) was a lifetime professional politician and a long time avid amateur golfer, which left him little time for anything else. He was Captain of the North Berwick club, 1891-92 and Captain of the Royal and Ancient Club of St. Andrews a few years later. He was called by some “the father of English golf,” most likely for his strenuous efforts to promote the game. The high point of his 50 year political career was his time as Prime Minister of the U.K. from 1902 – 1905. Earlier as the cartoon indicates, he was Irish Secretary. He was first known as a renowned philosopher, publishing A Defence of Philosophic Doubt , The Foundations of Belief , and Theism and Humanism . A tolerable day, a tolerable green, a tolerable opponent, supply, or ought to supply, all that any reasonably constituted human being should require in the way of entertainment. With a fine sea-view, and a clear course in front of him, the golfer should find no difficulty in dismissing all worries from his mind, and regarding golf, even , it may be, very indifferent golf, as the true and adequate end of man’s existence. In 1894 when Captain of the R & A and following its traditions, Balfour drove off the opening ball at the Autumn Golf Meeting with his friend Tom Morris nearby. Balfour commemorated this event with a poem that will appeal to all golfers who harbor first tee trepidations. I, full of nervous fears. Waiting to see me drive. Had tempted me to golf. Drove off—and that was all. In the early days, the preponderance of golfers were men. Below are two poems that took the “good wife’s” point of view. For their stood her Hub, at the foot of the bed. And there at the footboard had taken his stance. For the pill and was ready to give it a hook. When the chandelier stopped his magnificent stroke. The second poem continues our series “celebrating” the golf widow. This poem, “The G. W.” was written by Miriam Teichner, an American author and journalist, who early in her career wrote a daily column of verse and humor in the Detroit News. The poem appeared in the June 1916 issue of The American Golfer. And fills her time in irksome ways? Whose eyes are dull with sorrow’s glaze? Who seems to have no place to go? Whose holidays are filled with woe? To whom are Sundays all too slow? Their warm and pleasant sunshine bring. And blossoms white their petals fling? Forlorn as any little mouse? Who has been cheated of her spouse? In bogie makes the eighteenth hole? Of course, these poems represent historical artifacts of a time gone by. Or do they?